Upon searching the internet you sure can find so many options for taking steps to help ourselves to better health. But how do we know what works and what doesn’t? Sometimes we just have to try some things, but I’ve found it’s best to find a good resource. 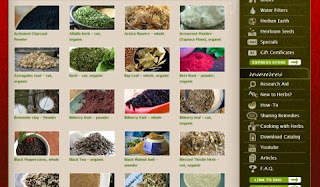 Shoshanna at the www.bulkherbstore.com is one great resource for natural healthy herbal solutions from improving your health to improving your recipes for cooking. I’ve used the arrowroot powder as a thickener when making real ice cream! Some of the other herbs I’ve used as teas to calm myself after an intense day of work, and others to improve my cooking recipes, and even others just as great soothing teas. Over a year ago I interviewed Shoshanna and her mom on my radio show Beyond Sustainable and learned so much about the use of herbs, and of course about how they carefully select and purchase their products to sell to the public. The reason I decided to share this info with you today was because I received their catalog in the mail and read the article about making my own tinctures. I really didn’t realize how easy it was. And there are lots of how-to’s on their site and in the catalog. Here’s a looksee onto their site… Isn’t this just inviting… Thanks Shoshanna for all you do! This entry was posted in Homesteading, How-To, Preparedness on February 27, 2013 by Homesteader's Supply. Homestead Product Featured in Hobby Farms Magazine! Hobby Farms Magazine contacted us several months ago and asked if they could feature one of our products in a spring issue. They had seen the product on our site and thought it would tie in perfectly with their spring line up of recommendations…. The Foldit Cart is the hardest working all-purpose carrier you will ever own. With the do-it-all Foldit Cart you can move up to 330 lbs. of cargo at a time, with hardly any effort. It is designed so loads are dispersed evenly over the axles. 20-inch wheels with pneumatic tires add maneuverability and stability over uneven terrain. 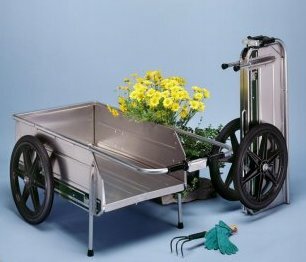 This amazing cart is also sold in two other models… One with a bike hitch and the other with a lawn tractor hitch! 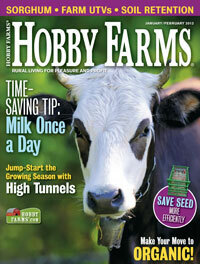 Be sure to check out the March Issue of Hobby Farms Magazine! Happy Homesteading from the Folks at Homesteader’s Supply! Hobby Farms contacted us a while back and asked if they could feature one of our products in their March 2013 issue of Hobby Farm Magazine. We’re excited to share a sneak peak of the product! This entry was posted in Homesteading, New Products on February 9, 2013 by Homesteader's Supply. Eco Mini-Pasteurizer and The Great Blue Cheese Kit! We’re always looking for some new products that are exciting as well as functional and needed on the homestead. Jerri has hit a home run this week with a couple of new items! 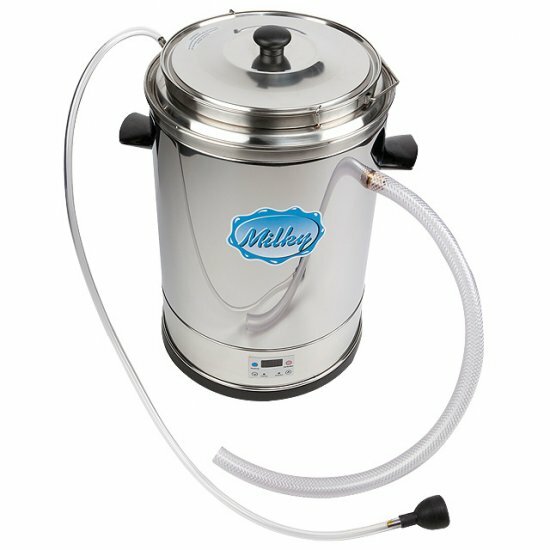 Eco Mini 3.5-Gallon Stainless Steel Pasteurizer will process 3.5 gallons/14 liters of milk to a temperature of 156 degrees F/70 degrees C in about 1 hour. Inlet and outlet hoses fill a water bath which is sealed against any contact with the milk and which provides a constant and gentle heating function. The water bath may be flushed with cold water to stop the heating process. The Eco Mini model has additional insulation for a more energy saving construction. Complete with thermometer and instructions. 120VAC. Wt. 13.5 lbs. Finally, by popular demand… we have added our own Great Blue Cheese Making Kit! But it’s not just any ol’ blue cheese… we have designed this to try your hand at making three different types: Roquefort, Cambozola, and Camembert! If you haven’t heard of Cambozola, it is a cross between a sweet cream type cheese and a Gorgonzola. 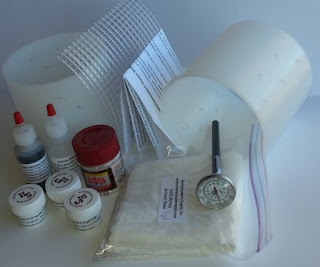 No frills, nothing to go to waste, the same supplies and equipment used by professionals to make cheese are in this kit. Everything you need is there except a rubbermaid or tupperware type plastic container with lid, which you may already have in your kitchen, this is what you’ll use as a cheese cave for this type of cheese. And of course, you will need the milk! We have provided 3 detailed recipes for Roquefort, Cambozola and Camembert cheeses. 2 Camembert molds, P. Rogueforti, P Candidum, MA4002, Liquid Veggie Rennet, Liquid Calcium Chloride, 2 Ripening/drying mats, thermometer, 1 sq yard cheesecloth, and Kosher course salt. We are very excited about this new addition because it’s been something that we’ve had requested for some time! Please come back and leave us some feedback if you purchase either one of these great products! The Folks At Homesteader’s Supply! This entry was posted in Cheese Making, New Products on February 4, 2013 by Homesteader's Supply.